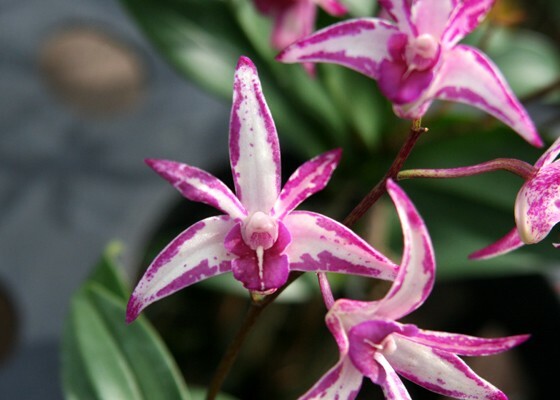 Vibrant magenta splatters, splotches, streaks, and dots decorate the tinted whited flowers of this Australian Dendrobium hybrid. The plants are very compact for such a production of flowers, and are cold-hardy, more cold tolerant than most Cymidiums. The is a cross between Dendrobiums Rutherford Sunspot and Tie Dye. 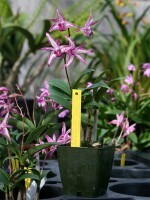 Overall height of a specimen plant is 11 inches.Temperature Tolerant. January - February blooming.